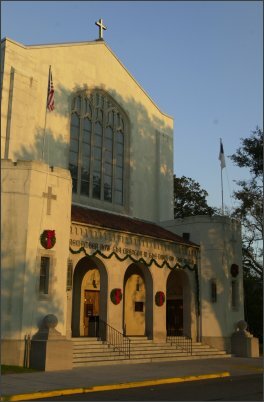 Experience the wonder and beauty of the 2002 Candlelight Christmas Service in Summerall Chapel. This viewing works best on high-powered computers with fast connections although you can download the file using a dialup connection if you are patient. Technical information about viewing these movies is listed below. Flash Player: The movies are located at http://sites.slicker.com/thecitadel/. Many computers already have a Macromedia Flash Player installed. If the movies do not play properly on your computer, it is probably because you do not have this type of player installed, or you have an old version installed. You can obtain the latest version of the Macromedia Flash Player by clicking on this link. Download Time: On a dial-up modem, these movies take a long time to download. Be prepared for a long wait before viewing them. There is a status bar to indicate how far the download has progressed. Troubleshooting: As with viewing any other web site, problems can occur. If you encounter problems, the best thing to do is to try another browser, or try another computer.